Finally, a pineapple and tomato soup free stew…This one is a crowd pleaser and smells like pizza. How could you say no? Cut meat into cubes, roll in seasoned flour. Melt margarine in pan, add meat, saute until well browned. Add onions, crushed garlic, chopped bacon; cook further 5 minutes. Add herbs and stock; stir in a little of remaining flour. Cover, continue cooking until meat is tender (allow a couple of hours). About 15 minutes before end of cooking time, add peeled, chopped tomatoes (ok so I didn’t bother peeling them) and thinly sliced green pepper; season to taste. Serve with hot rice. Perfect for a chilly winter evening! What’s your go to stew? 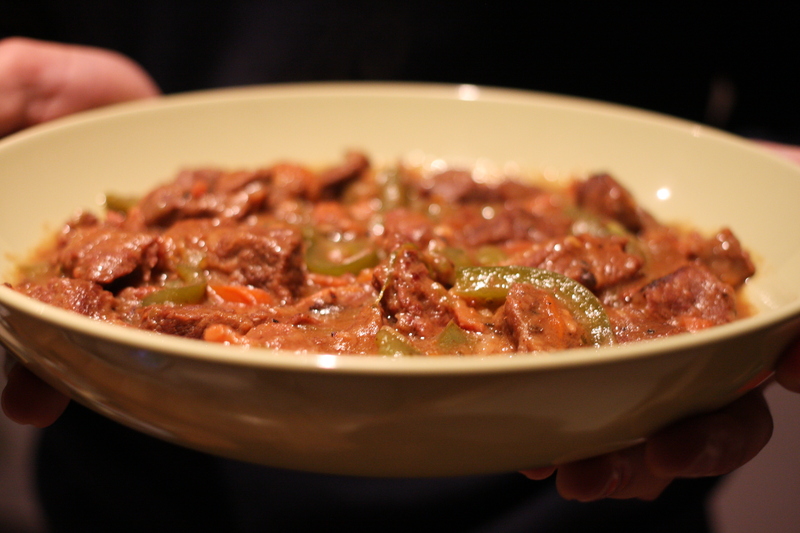 This entry was posted in Main Course and tagged Food, simple food, stew. Bookmark the permalink. I just had creole for the first time in Berkeley, CA. It was delicious! This looks soooo good. Ooooo yum! This one was good, lovely tender meat. Loving your travels!